INTRODUCTION: Not all carbohydrate foods (“carbs”) are created equal; some are broken down very quickly into simple sugars and others are broken down very slowly. In the past the terms “simple sugar” and “complex carbohydrate” were used to imply this concept there are newer terms that enable us to know how much eating these foods will raise blood glucose in healthy people. The “in healthy people” is important, as the ability to tolerate carbohydrate in those with insulin resistance (“pre-diabetes”) or Type 2 Diabetes is significantly affected. This is the first article in a new series on carbohydrate. The Glycemic Index (GI) is a way of rating carbohydrates based on their ability to raise blood sugar. Low GI foods (those with a value of 55 or less) are more slowly digested, absorbed and metabolized and cause a lower and slower rise in blood glucose levels and very high GI foods (>70) are digested very rapidly, casing a large spoke in blood sugar. High GI foods (>55) are result in a fairly rapid rise in blood sugar. Many of the foods people eat lots of in our society, such as bread, rice, pasta and cereal, even vegetables, are high GI foods. As once healthy people continue to eat these foods on a regular basis, they put a high demand on their body to produce and release insulin, which brings all that glucose into their cells. This insulin is released from the beta cells in the pancreas and people eating these high GI foods means that their beta cells have to release insulin over and over all day long and this constant demand on the beta cells, over time, results in the cells throughout their body becoming insulin resistant (no longer responding to insulin’s signal) or burning out their beta cells, resulting in Type 2 Diabetes. Many people don’t realize that by the time they are diagnosed with Type 2 Diabetes, they already have beta cell dysfunction, beta cell death and/or a decrease in beta cell mass. Once beta cells die, they’re gone. Our once healthy body is no longer healthy. When we eat foods with significant carbohydrate – especially high GI carbohydrates, our ability to release insulin is significantly impacted and as a result, we can no longer tolerate carbs like we used to. While the mechanism is different, it’s similar to someone that becomes intolerant to gluten; once they’re celiac, they can no longer tolerate foods that contain gluten without causing damage to their body. Depending how long someone had Type 2 Diabetes when they were finally diagnosed, or how long they had it before they changed their eating habits will all factor in to how much carbohydrate they can process. For this reason, each person is different. It’s not that carbs are inherently “bad”. It’s that our bodies are no longer able to process some of them they way we could when we were still healthy – so in those cases, the sugar stays in our blood, damaging tissues throughout our body. Knowing which carbs are high GI is important, because these are the foods that tax our already overtaxed beta cells if we are not Diabetic and limiting these foods significantly, or avoiding may be the best way for healthy people to remain healthy. The good news is that there are some types of carbohydrates that some people can not only tolerate, but may actually improve their blood sugar control, and that’s the topic of an upcoming article. The GI value of a food is determined by feeding a group of healthy people the amount of a food that contains 50 grams of digestible (available) carbohydrate and then measuring the effect on their blood glucose levels over the next two hours. The area under their two-hour blood glucose response (glucose AUC) for this food is then measured. At another time, the same group of healthy people eat 50 grams of glucose, (which is the reference food) and their two-hour blood glucose response is also measured. The GI value for the test food is calculated for each person in the group by dividing their glucose AUC for the test food by their glucose AUC. The final GI value for the test food is the average GI value all the people in the group. Many of the foods that people in the West enjoy and eat a lot such as bread, rice and noodles are High GI foods – these are ones that are rated at ≥ 55 (compared to pure glucose, which is rated at 100). 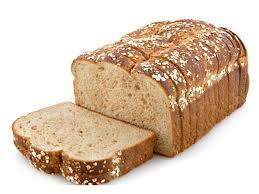 White bread has a GI of 75 ± 2 and whole wheat bread isn’t much better, at 74 ± 2. 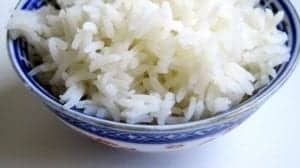 Boiled white rice is high GI at 73 ± 4, and while somewhat better boiled brown rice is still high GI at 68 ± 4. 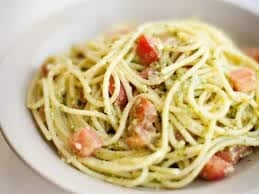 White spaghetti has a GI of 49 ± 2 and whole grain spaghetti has a GI of 48 ± 5. 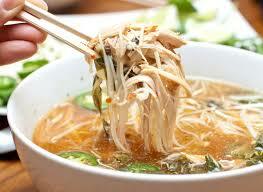 Rice noodles, such as those in Pho (Vietnamese Beef Noodle soup) are even higher, at 53 ± 7. People in our culture eat a lot of bread, rice, pasta, starchy vegetables and cereal but one of the things we know is that eating them with good source of protein slows down how quickly they affect blood sugar. Oftentimes bread and cereal form the basis of breakfast, perhaps with a high GI glass of juice and frequently, people eat pasta with a tomato sauce for supper (or leftovers for lunch), and this kind of meal will spike their blood sugar. We also know that the fiber content of a mixed meal will also slow down the rate at which blood sugar rises from these carbs, so there are ways to ‘tone down’ the response. If you have a family history of Type 2 Diabetes, are overweight or have high blood sugar, it’s important to understand that what you eat matters and to eat in a way that does not put high demand on your beta cells to keep releasing insulin to process all that glucose. The time to consider the effect on your body is now – before you get sick by having overtaxed your pancreas’ beta cells and experience beta cell death or mass loss and are diagnosed with Type 2 Diabetes. Once we’ve crossed that threshold; once our once healthy body is no longer healthy, we need to learn to eat in a way that does not put high demand on our beta cells, that does not require our body to process large amounts of glucose at a time, in order to preserve whatever beta cell mass and function we have left. Determining which carb-containing foods we can tolerate and in what quantities will enable us to eat in a way that keeps us from getting worse and keeps us from developing the very serious consequences of not doing so, which can include blindness, toe and food amputations and more. In coming articles, I’ll explain Glycemic Load and the Insulin Index and I’ll also touch on a role for legumes (pulses) such as chickpeas and sources of “resistant starch” in a moderate carb ‘Mediterranean-style’ diet. Stay tuned. If you just found out you are pre-diabetic, now is the time to do something about it. Waiting will not make it better. If you’ve been recently be diagnosed with Type 2 Diabetes, it’s not too late. Studies have shown that changing eating habits and lifestyle soon after diagnosis makes it possible for some people to reverse their symptoms and to have their Diabetes go into remission. One thing is known, that doing nothing will bring needless firsthand understanding to the phrase that “Diabetes is a chronic, progressive disease”. It doesn’t have to be. If you want to know how I can help you, please send me a note using the “Contact Me” form located on the tab above.